“Jesus and his disciples came to the other side of the sea, to the territory of the Gerasenes. The herd of about two thousand rushed down a steep bank into the sea, where they were drowned. The swineherds ran away and reported the incident in the town and throughout the countryside. As they approached Jesus, they caught sight of the man who had been possessed by Legion, sitting there clothed and in his right mind. Then the man went off and began to proclaim in the Decapolis what Jesus had done for him; and all were amazed.” -Mark 5:1-20. St. Blase devoted the earlier years of his life to the study of philosophy, and afterwards became a physician. In the practice of his profession he saw so much of the miseries of life and the hollowness of worldly pleasures, that he resolved to spend the rest of his days in the service of God, and from being a healer of bodily ailments to be- come a physician of souls. The Bishop of Sebaste, in Armenia, having died, our Saint, much to the gratification of the inhabitants of that city, was appointed to succeed him. St. 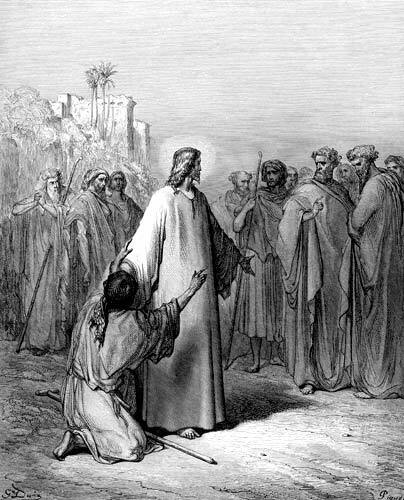 Blase at once began to instruct his people as much by his example as by his words, and the great virtues and sanctity of this servant of God were attested by many miracles. From all parts the people came flocking to him for the cure of bodily and spiritual ills. Agricolaus, Governor of Cappadocia and the Lesser Armenia, having begun a persecution by order of the Emperor Licinius, our Saint was seized and hurried off to prison. While on his way there, a distracted mother, whose only child was dying of a throat disease, threw herself at the feet of St. Blase and implored his intercession. 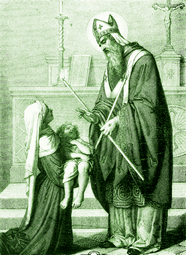 Touched at her grief, the Saint offered up his prayers, and the child was cured; and since that time his aid has often been effectually solicited in cases of a similar disease. Refusing to worship the false gods of the heathens, St. Blase was first scourged; his body was then torn with hooks, and finally he was beheaded in the year 316.